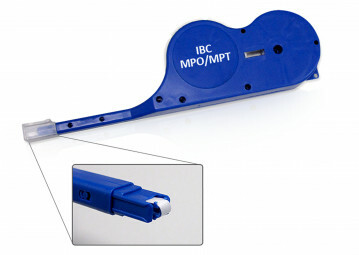 Clean your MPO/MTP plug or jack with the handy tool BEFORE you bring your optical links into operations. The MPO plug can have 24 parallelly arranged fibers in a 2 x 12-times ferrule. In the field a QSFP+ SR4 has a MPO plug with 8 parallelly arranged fibers. If there is one fiber dirty the optical path of nearby fibers can be influenced.